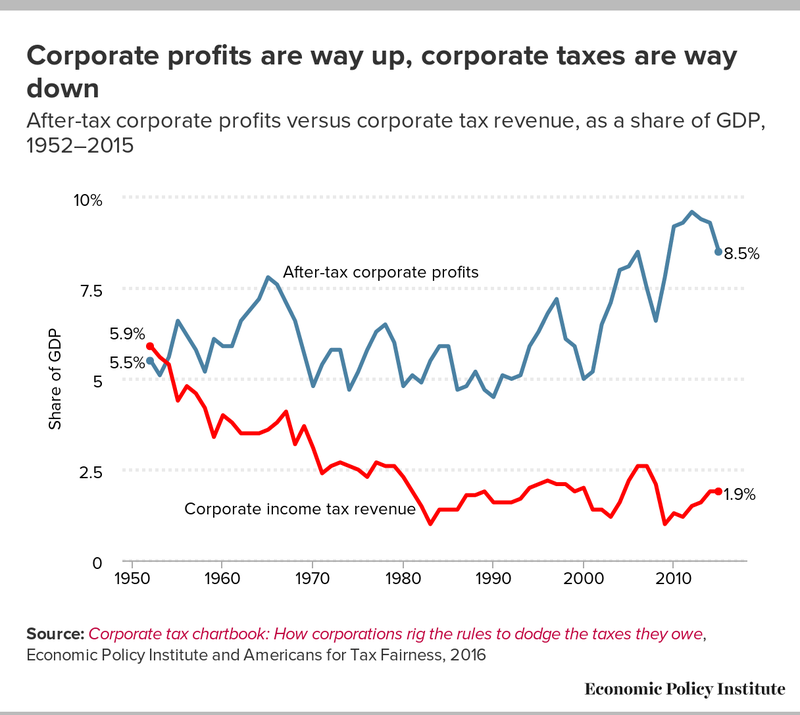 Since 1952, corporate profits as a share of the economy have risen dramatically (from 5.5 percent to 8.5 percent), while corporate tax revenues as a share of the economy have plummeted (from 5.9 percent to just 1.9 percent). This trend has worsened since the end of the Great Recession. Between 2010 and 2015, corporate profits averaged 9.2 percent of gross domestic product, while corporate income tax revenue averaged just 1.6 percent. The driving force behind the recent erosion of the corporate income tax base is the largest corporate loophole— deferral of taxes paid on profits booked abroad. Deferral allows corporations to stash billions of dollars offshore to avoid paying taxes on them. As outlined in a new Americans for Tax Fairness and EPI Chartbook, deferral will drain the U.S. Treasury of about $1.3 trillion in tax revenue over ten years. The crucial point is, however, that these profits have not actually been earned abroad. They are, in fact, offshore only on paper. Reed College professor of economics Kimberly Clausing estimates that seven tax havens are responsible for 50 percent of all foreign profits, but account for only 5 percent of their foreign employment. If the next president and Congress decided to tackle corporate tax reform, perhaps the single largest priority should be closing the gaping deferral loophole, which not only causes the federal government to hemorrhage revenue, but also provides an incentive for U.S. companies to shift production and large profits offshore.